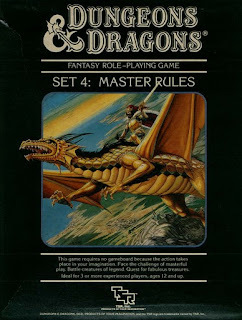 You may note how from time to time I climb to the top of the soapbox and proclaim great things about classic D&D, the BX sets, the Known World of Mystara. But I tend to be curiously silent about the Mentzer editions that dominated the classic D&D line after 1983. No longer! You shall know the truth. It goes like this: Mentzer D&D, BECMI, is the greatest series of D&D sets... that I shall never play again. BECMI, incidentally, comes from Basic, Expert, Companion, Master, Immortal - BECMI. The reasoning is pretty simple. 36 levels is just way too much room to advance. There is absolutely no way I'll stick with a campaign long enough for a group to get a fraction of the way, and when I stand at the base of the Mentzer Mountain, gazing longingly at the cloud-wreathed peak where the "Paths to Immortality" lead folks beyond the sky to the Immortal Playset, I turn around and say, keep your mountain, you bearded sadist. I'm off to play a game we can actually "finish" in a few years. So there you have it. You've learned that I have a low attention span, but possess enough self-objectivity to recognize this monstrous flaw. See, a few decades ago it was the opposite; "Who wants to stop playing at level 14, like that unfinished Cook Expert set, when Mentzer lets you go all the way to level 36? The sheer genius!" Oh how we change. Here's the problem - playing 3-4 times per month, our old school characters are leveling once every 3 or 4 months. After a year and a half, our current set of guys is level 6 or so. I've resisted the urge to nuke the campaign so far, but how long can I hold out? My brain is exploding with ideas. I'm always on the edge. The thought of trying to spend 144 months (that's 12 whole years, brother) trying to get to the top of Mentzer Mountain, just to find out there's a whole series of Immortal levels to start climbing, is just too much for my comprehension. I had to turn my back on BECMI. When we dabbled with the 4E, with its mad-fast power-leveling, guys would level once per month, meaning that an end-to-end campaign would be about 3 years. These days, I much prefer the achievable level curve in Moldvay-Cook's BX edition (level 1-14, even though they hinted at 36 levels). Even with AD&D, I don't recall folks playing it after levels 10-14 - about the time they got knee-capped by The Tomb of Horrors. Even if I didn't nuke the whole setting, I'd be ready by then to retire those characters in the campaign and start over. That all being said, there's no greater model for what should be in WOTC's new D&D than the contents of those BECMI books. They want modular, Frank Mentzer gave us modular. Everyone starts out kicking doors and stabbing monsters in the face with the Basic Set; when the dungeon shtick gets old, you're ready for towns, hex crawls, and nautical jaunts in the Expert Set. Player options, mass combat, and domain ruler ship are in the Companion Set; Artifacts, Paths to Immortality, and Planar Travel are the Master Set, and finally you have the Immortal end game. Is that modular, evolutionary game play or what? Oh well, what do I know? It seems about time for a new poll. So tell me, o wise and knowledgeable readers, what kind of level range do you like to see in your D&D games? My old campaigns, when I was much younger, lasted until the characters had reached double-figures, but that was it. My last completed campaign (for D&D) ended around levels 9/10, although my Star Wars game ended at level 20 (and boy, where they broken). My current game, after 20 sessions, has the PCs at level 3 but close to level 4 (for some)... although on Monday night they may well all die at the hands of all those undead. I've got a group currently spread from level 5 to 14 and it's still fun. Mostly because there's no cleric in the party (there being an annoying lawful monolithic church in this campaign) and they must still spend a lot of time and resources healing so the need for treasure keeps them going. I'm good until level 18-24 I think. I've been very generous with the exp this campaign however so folks are advancing at a fair clip so a PC tends to level every 3-6 sessions. While I also adore the BECM sets (not so much the Immortals set), and I like some of the options that especially the Companion Set brought, I'm also of the opinion these days that about level 14 is really as high as the campaign needs to go. In the fourteen years since I left the US, I've never had a character I started at level 1 (or one played under me) get higher than level 7. In play by post, this gets even tougher. I've been playing with a Labyrinth Lord group, and only the cleric and the thief have reached level two in six months of play (which is really just in the nature of PbP). But with no character leveling more than twice per year, it would take us three years to reach level six (if that). As I've started prepping my own game, I've wondered about this very issue, even toying with ideas like increasing the xp value of everything. It's too boring just to say "me too!" but that's pretty much how I feel about this post. I have long been of the opinion that beyond level 14 is pretty iffy a goal in campaigns (at least nowadays), and there is an awful lot of stuff in the BECMI rules that I simply can't be bothered to include in my games; things like weapon mastery and the skill system, etc. YMMV, of course. It's nice that they are pretty modular, but it's still a lot of unused material (for me) filling the pages. I hate games beyond the mid-teen level ranges. Personal opinion but I dislike the power increase beyond that. Beedo: If your goal is to get to the higher levels, why don't you skip ahead years in your campaign? Play a series of adventures up to, say, level 6. Fast forward for a few years in game and hit, say, level 10 for the next series. There's no need to slog your way through every single level if it's holding you back from enjoying things. It's like skipping ahead a few years between movie sequels. I may be in the minority, but I've always believed in the adage that "the journey is better than the inn". I am currently a player in Beedo's Gothic Greyhawk campaign and I can tell you that the campaign has absolutely taken on a life of its own. As players, we are all aware of Beedo's Gamer ADD, but switching from a campaign that we all obviously love, to something new (just for the sake of a new idea), is more than a little sad. Obviously the idea behind the Sandbox is to give the players choices, and let them write their own stories. Using that as a measuring stick, Gothic Greyhawk has certainly been a success. Since beedo doesn't fudge dice rolls, I imagine someday that all of us will wander into something that we can't make it back from. When that happens, within the confines of the Sandbox, I guess I can live with that. There has to be some level of accomplishment on the part of a DM in being able to run a campaign for an extended period of time. I've played these games for 30+ years and have been involved in levels 1-7 for most of them. It's nice to hear that some DMs have taken their campaigns up into level 20 and beyond. I do understand that the game probably breaks down at some point, but it would seem that the original idea behind a campaign would be to take the story to some degree of closure. In a Sandbox, since there are only guidelines, but not a railroad driven plot, that story continues for as long as the characters exist. In rereading some of the game reports, there were numerous instances where the entire party could have bought the farm. The continuance of the campaign should be the reward of sensible, intelligent play, as well as a little luck. Since, as I said, Beedo doesn't fudge dice rolls, every week that we get to continue the campaign should be considered more of a privilage and less of a curse. You could level up the survivors after every game session. Then a campaign would last about a year. Also, no tracking of XP or XP gain as the sole motive for possibly questionable actions e.g. 'How much experience for killing the orc children?'. If you are interested in getting your players to higher levels in a realistic timescale you could always tweak XP awards, such as awarding XP for finishing an adventure or completing a task. I think in the Companion set there is a section on how much XP per adventure, and it recommends 3-5 adventures per level. Personally I prefer a more rapid progression of 2-3 adventures per level, but that's just me. Just as a nitpick, I thought that 1E was open-ended about human level limits, while it was 2E that suggested retiring PCs at 20th level. I believe the B/X range is almost perfect for a game starting at first level. The highest-level spells that can be prepared are 6th level (for magic-users) and 5th level (for clerics) which very naturally defines the power level of the campaign. (This is the same range as in OD&D.) Even so, I suspect double-digit character levels are more aspirational for most games. Going beyond that would require a volume of gaming that is far past most people. I would second Dave Baymiller's point, though with a slightly different emphasis. I think the idea of miniseries campaigns (more than one session, but not as open-ended as a full campaign) is very promising. One could use pregens or build higher level characters to begin with. I've wanted to do this with the 2E adventure Vecna Lives! for a while. You have identified the problem with BECMI that I saw in the 80s. Even if you could invest the time to get to 36 (no one did), are the Immortal adventures even interesting? I have a couple of the Immortals modules and they don't seem all that much fun to me. In D&D, the fun happens in levels below 10. Highest level I ever played was 12. It took several years of playing several times a week (and more during summers!) to get there. Had no interest in playing anything higher. Different level ranges suit different campaigns - some 1-30, others 1-5 or 1-10. BTW the Rules Cyclopedia recommends 1 level per 5 sessions, and Moldvay similar - some-one levelling up within 3 sessions AIR - your rate is about half that, and slower than normal I'd think. One PC, Thrin, in my original 1e AD&D campaign reached 117th level Cavalier-Cleric-Magic-User Lesser God BTW. :) In AD&D I never had any trouble challenging solo PCs or small groups of PCs at any level. "I saw a discussion about this before but I can’t remember where. You are not the only person to have this problem. Have you house ruled anything else in your game? If so house rule this! You could just give out double the experience points. You could give out more treasure. You could make the monsters worth double xp. You could just advance people two levels at a time. I think one suggestion was to have characters advance a level between sessions (as long as they are not in the middle of something). Then you ask them “Ok, so what did your character do to get that level?” Divide the amount needed by some factor so that the advancement rate meets your needs. e.g. start at 75% and if that is still too slow keep bumping it down. I hope this gets your imagination going. I don't have any agenda specifically to see the players reach high levels, but I would like to think there's a point that we'll end this particular campaign, they'll have achieved whatever they wanted to achieve, and we'll look back at the experiences fondly. In AD&D and BX, you can start making that argument pretty much any time the group clears 9th level and moves into domain rulership and attracting followers. The characters set down a legacy. That happy place seems to be after 2-3 years of play. While I applaud the comprehensive vision behind BECMI, I just can't see investing a decade of steady play in trying to max out the system (although, if that was a stated goal, I did note some posters suggested XP house rules to allow power-leveling). We try to be a bit more by-the-book than that.